Left to right. Tony Brooks, Sir David Brown, Sir Stirling Moss, driver and writer Denise McCluggage, Innes Ireland, not known, Maurice Trintignant, Jack Fairman, Phil Hill 1961 world champion driver and Aston Martin team member, Paul Frére. Every year the Pebble Beach Concours highlights a classic make. First time I went, in 1989, it was Aston Martin, celebrating the 30th anniversary of a memorable victory at Le Mans and the Fédération Internationale de l'Automobile (FIA) International Championship for Makes, the world sports car championship. Winning drivers reunited with their cars. Aston Martin's caretakers Victor Gauntlett and Peter Livanos brought former owner, the vigorous octogenarian Sir David Brown, together with six drivers for a week-end reunion. The Champagne corks popped at a dinner hosted by Mercedes-Benz North America, on the eve of Laguna Seca race day, before the Concours. Mercedes-Benz could afford to be magnanimous; it had just finished first, second and fifth with its Sauber Silver Arrows at Le Mans. Here too were Aston Martin's new-found (if temporary) majority shareholders in the person of Donald E Peterson Chairman of Ford Motor Company and Edsel Ford himself. They were judging the enthusiasm of West Coast car buffs towards their recent acquisition. Sir Jackie Stewart was a Concours Judge, chirruping excitedly to Edsel Ford as a new Lagonda, made by Aston Martin, swept past. "That's a beautiful car Edsel." "That's a terrible car Jackie." "It's good in parts Edsel. It's got some nice features. It's like a beautiful woman with some bad features." Edsel had firm views on style, something in his book the Lagonda didn’t have. Laguna Seca had style. Aston Martin commissioned a Hollywood film set replica of the Le Mans pits (pictured above), complete with painted spectators and dummy gendarmes and a clock at five to four, the traditional start and finish time. The cars lined up in front, with Roy Salvadori of Britain and Carroll Shelby of the United States, the winning drivers who vanquished the Ferraris and the Porsches that memorable week-end thirty years before. Here were Stirling Moss and Jack Fairman who set a cracking pace to draw out the Ferraris but retired with transmission trouble. Here too Belgian journalist Paul Frére and French mayor Maurice Trintignant, wiry now, creased a little, thinning on top, who finished third. The cars, they joked, had lasted better than they. Other Aston drivers joined the party; Tony Brooks from Weybridge, brilliant, often a match for Moss and the irrepressible Innes Ireland. 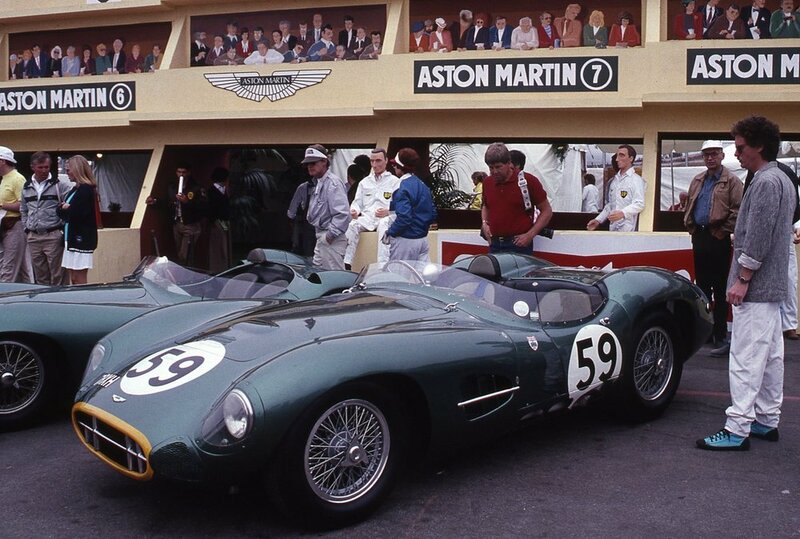 Monterey, as Peter Livanos promised, was a sea of British Racing Green. Some of the Pebble Beach Concours competitors the following day were a little overdone. The wooden running boards and battery box of John and Patricia Mozart's magnificent 1910 Rolls-Royce Silver Ghost was french polished. Anything not gleaming chrome or silver-painted was silver-plated, save the shining brass-ware on the engine. The Concours, like the showpiece Rolls-Royces ran faultlessly. No vulgar advertising banners, no raucous sponsorship. The participants were all so rich they didn’t need it and the Pebble Beach Corporation would have thought it poor taste. Local charities benefitted instead. Pebble Beach was as much about people as about cars. There was some serious role-playing by senior citizens, dressing up in the authentic overalls of 1950s drivers or even race mechanics. The cars of these sometimes white-haired aces were painted in the exact livery, complete with advertising signs, of their racing heroes thirty or forty years ago. Unlike the Vintage Sports Car Club, classic car enthusiasts in America tend to be mature ladies and gentlemen, recapturing their youth. They are certainly people of substance, the cars marshalled by discreet young men in blazers at Pebble Beach were, on average, a million dollars apiece, - all 120 of them and that was not counting the racing cars at Laguna Seca up in the hills. Real heroes were here too. Nuccio Bertone an honoured guest, to see his cars carefully restored, rescued from obscurity, from something close to the grave, recreated just as they were in the heady days when they were haute couture. The crowds parted like a sea to watch Stirling Moss; to them, he was motor racing history, a real-life hero in a real-life role Clint Eastwood, mayor of Carmel across the bay, could scarcely match. Above 1) Aston Martin DBR1 300 victorious at Le Mans 1959 2) Sir Stirling Moss and Sir David Brown climbed on the back of the winning Salvadori/Shelby car for the victory parade at Le Mans. 3) Repro Le Mans pits with painted spectators and dummy mechanics 4) Paul Frére and Maurice Trintignant who drove the second-place car at Le Mans with Aston Martin owner in 1989 Victor Gauntlett. 5) Charles Anthony Standish ‘Tony’ Brooks won the 1957 100Kms Nürburgring and 1958 RAC Tourist Trophy in DBR1 Astons but crashed at Le Mans in 1957. Veteran sports car driver Jack Fairman beside him co-drove in 1959 with Stirling Moss. Fairman is remembered in a Wetherspoons’ pub at Horley. 6) Carroll Shelby and Roy Salvadori drove the winning car in 1959. Above: 1) Paul Frére and Maurice Trintignant. 2) Robert McGregor Innes Ireland was driving for Ecurie Ecosse in 1959 when his D-type Jaguar engine failed. New Scottish driver Jim Clark had better luck. He came 10th with John Whitmore driving a Lotus Elite. 3) Sir Jackie Stewart interviewed by local radio 4) Shelby, Salvadori, Brown, Moss, Fairman. 5) Crowds surround Aston Martins. DBS 62EMU finished second at Le Mans in 1958. 6) Veteran Lagonda V12. In 1939 under WO Bentley they finished third and fourth.